Rural South-American-styles fuse with electronic futurism on this stunning snap shot of the burgeoning experimental electronic scene that has emerged in Buenos Aires over recent years. 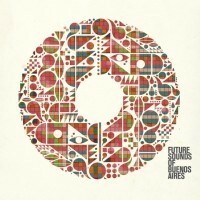 Pioneering Argentinian label ZZK Records release their scene defining compilation ‘Future Sounds Of Buenos Aires’ on CD, 2xLP and digital on 5th November. The wild 8-bit cumbia bass of Super Guachin and crisp snares of the outlandish Frikstailers sit alongside Tremor’s glitchy and futuristic take on Andean folklore. Other artists that feature include El Remolón, a psychiatrist turned musician, and La Yegros, partner of fellow ZZK artist King Coya, and the label's first female signing. Buenos Aires may mean cosmopolitanism, tango and slabs of beef to most people, but this is a city whose cultural life extends way beyond the usual tourist signifiers. It has become the home for a group of musicians linking traditional South American styles with the digital instrumentation and global reach of modern dance artists, to create a raucous, boundary-pushing electronic music – and ZZK Records is at the heart of it all. "ZZK is the first label to push the sound of Argentina from the villa (ghettos) to the uptown. ZZK is a big part in bringing this to the attention of the people."